Pacing and suspense are two of the most important aspects when attempting to develop a story that is capable of truly terrifying the reader. Ultimately, if you aren't worried about what happens to the characters then you aren't worried about the story in general. 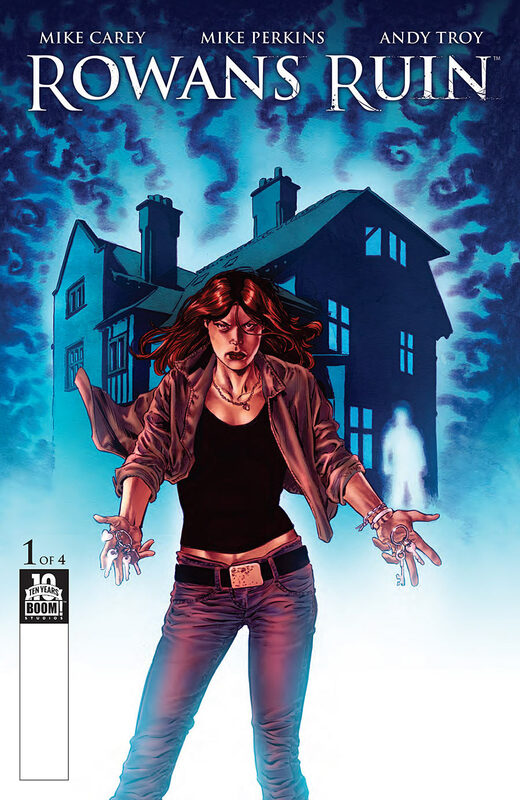 Digging into the deepest fears that manifest whenever I'm alone in a house, this first issue had me scared and hiding under the covers more than anything that I've read before. A woman called Katie arranges to temporarily stay in a large house in rural England but quickly discovers that the house offers far more than she bargained for. You are undoubtedly going to be sucked in by the first three pages of this issue; the interrupted phone call to the police is a trope that repeatedly catches me. Clear and absolute panic can be seen in her voice, but the mix with pure determination latches you on to the character really quickly. Her desperation to not be thought of as weak or to be caught short speaks testament to her strength as a character and to Carey for writing someone that is so compelling to read about. 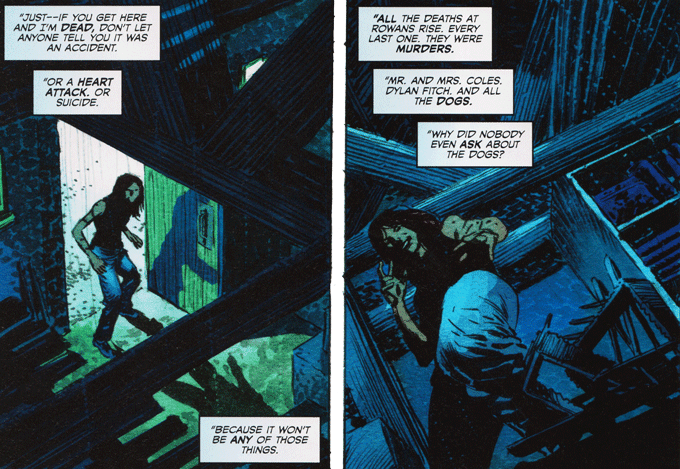 Andy Troy's colours fit so perfectly to ground the night scenes in darkness and shadow that you get subsumed by the feeling of loneliness. We've all had those nights where we've been left somewhere by ourselves and jumped at every shadow; the colouring constantly re-enforces this feeling and creates such a strong atmosphere. Perkins' use of perspective to keep the reader directly next to Katie heightens the reactions to the scene as you are seeing exactly what she sees. Keeping the mix of determination and fear written on Katie's face must have been difficult and the uneasy body language that can be seen throughout the later scenes is a subtle detail that demonstrates just how uneasy she is. By keeping the plot in relatively established roots, it gives the story a classic feel, but the inclusion of technology gives it the modern update that it needs. It's worth noting that this isn't a "The ghost has infected the Internet" story, but instead uses the technology as our way in. Throughout her stay in the new house, Katie keeps updating a blog about her exploits and is in regular communication with her parents and the original tenant of the house. Although it is not as apparent as movies like The Blair Witch Project, we do seem to be observing the story using the "found footage" that she has left online. Very quickly this implies dark things in the future of our character, but only time will tell. For me, the part of the story that hits the hardest is the utilisation of those paranoid moments that you have in day-to-day life where you'd swear, for a second, that there's someone just on the edge of your vision. Given the static nature of the medium, the reader gets a far longer and more certain glance at these moments to know that it's not just in her head. Perkins manages to obtain the exact level of detail to let you know that there's something definitively there, but doesn't hand over enough detail to categorise the thing that's chasing her. Something about this first issue lets me know that this miniseries is going to be special. With Halloween drawing closer, my genre-appropriate sense is tingling and this is exactly the book that I needed right now. Even though it probably won't finish until after Christmas, the mystery and intrigue that have been crammed into a single issue is an impressive feat. Judging by the fact that even the daylight and happy scenes don't feel safe thanks to the intense and shadowed art from Perkins and Troy, life doesn't hold a lot of hope for our protagonist. Carey has a doorway into the core of what makes me truly terrified and I wish he would give it back; I need more sleep as it is.